Aerial view of waterfowl habitat near Erickson, Manitoba. Canadian Federal Government (Canadian Wildlife Service), United States Fish and Wildlife Service, Ducks Unlimited (Canada), Manitoba Department of Natural Resources and Universities in conjunction with the Delta Waterfowl Research Station, Delta, Manitoba. The Canadian and United States governments, working together, have driven and flown certain survey routes year after year through and over the Municipality to determine changes in duck populations. Ducks Unlimited have been involved with water management projects on the Rolling River to control levels on Otter Lake and Proven Marsh (Fig. 2). In addition, they have worked with individual farmers in the area on aspects of duck nesting. The Manitoba government has conducted various surveys, especially on Otter Lake, to determine numbers of migrant waterfowl. Probably the most conspicuous area of research has been that done by students working towards their degrees in waterfowl biology. These students resided in the Municipality and came to know the local people. With the assistance of universities and the Delta Waterfowl Research Station, there have been degree studies con­ ducted since the 1950's and they are still ongoing. One area that has been studied most extensively is section 21- 17-1SW. At present, this land is owned by Ho!mbergs, Sundmarks and Kingdons. 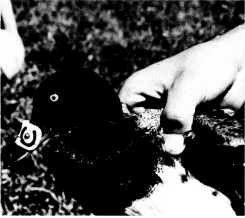 The species of duck under observation in all of these degree studies was the Lesser Scaup Duck (commonly known as the "Bluebill", Fig. 3 and 4). The Rural Municipality of Clan william is recognized also for its good water fowl hunting. Hunters have come from across Canada and the United States. The most well known and intensively hunted area is Otter Lake (Fig. 5). Large numbers of ducks, especially diving ducks such as bluebills, congregate on this large shallow lake during migrations. The result of this hunting activity, especially by non-locals, has been to stimulate the economy of Erickson and other nearby towns and to enable the formation of many new and lasting friendships. 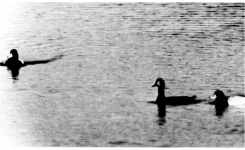 Water fowls have always been important to the Rural Municipality of Clanwilliam. In the past, they have provided food and recreation and have attracted people and resources to the area. With proper management, they will continue to do so in the future. 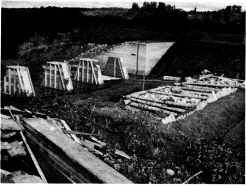 Otter Lake dam under construction, Rolling River, October, 1945. Two males and a female Lesser Scaup. Male Lesser Scaup marked for future observation.